Chicago was one of the most popular pop-rock acts in the U.S. in the 70s, offering solid, horn-based MOR chart hits amidst harder rock and jazz-rock fusion tracks that reached over and grabbed enough fans on the fringes of mainstream music to generate a uniquely broad following. The band’s aptly titled sixth LP, Chicago VI was released on June 25, 1973 and quickly became one of their most successful. (To view, download and comment my Chicago playlist, click here). Chicago VI held several firsts for the band. It was their first recording at a studio custom-built in Colorado by manager and producer James William Guercio, who had overseen all previous Chicago productions at studios in New York City (but not their hometown?). The album also welcomed Brazilian percussionist Laudir De Oliveira, who would command the skins for the next eight albums and bring a much smoother, Latin-tinged rhythm to the band’s sound. And it marked the first Chicago album on which trombonist James Pankow penned two hits to bandmate and keyboardist Robert Lamm’s none. On the first five Chicago albums, Lamm carried the songwriting and with one exception, “Make Me Smile” (1970), Pankow never could match Lamm’s parade of pop-rock hits. But with the #4 single “Just You ‘N’ Me” and the #10 “Feelin’ Stronger Every Day,” Pankow outshone Lamm (at least for one moment). 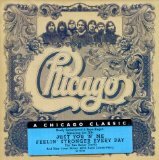 Chicago VI spent five weeks in the #1 position on the Billboard Pop Album chart, the second of four straight Chicago albums to reach the pinnacle and the fourth in a string of eight straight Chicago Top 10 albums from 1970 to 1977. That chart dominance places Chicago up there with Aerosmith and the Beach Boys among the top selling American rock bands in history. My Top 25 Chicago tracks are in the Playlist Vault, and Chicago IV is available as a CD or mp3 downloads on Amazon and as iPod downloads on iTunes.